The Currency Strength Bars indicator computes a “strength” from an un-weighted geometric mean of several currency pairs. This is similar to the US Dollar Index (USDX) and FXCM’s USDOLLAR. However, it does this, not just for the USD, but for 7 other currencies too. That’s 8 major currencies in total: USD, EUR, GBP, CHF, JPY, AUD, CAD and NZD. It does this by analysing up to 28 separate currency pairs. The raw strength indices are further processed using the popular RSI (Relative Strength Index) indicator. The RSI does a great job of “normalizing” the strength values for all 8 currencies into a range between 0 (very weak) and 100 (very strong). The indicator ranks all 8 currencies according to their strengths and displays them as a “strength bar” (either horizontal or vertical) on your chart. Key to a good analysis of the forex market is the ability to consider multiple time-frames. The Currency Strength Bar indicator does just that. Up to 4 time-frames can be assessed with a single instance of the indicator. The Currency Strength Bars indicator is useful for finding good candidate currency pairs for trading. For example, one should look to trade a strong vs weak pair, since these pairs will likely have the best trends. Once candidate currency pairs are found, then other trading techniques such as traditional indicators, support / resistance, etc. may be used to find an entry. Period 1/2/3/4: The time-frame / period to be used. The indicator supports up to 4 configurable time-frames. Length 1/2/3/4: The length / period of the RSI indicator which is used process the “raw” strength index. Price type: This can be Close, Median or Typical. Version: This can be Full, Mini or Lite. Also “Lite + CHF”, “Lite + CAD” and, “Lite + NZD” are now supported. Orientation: This can be Horizontal or Vertical. Show period 1/2/3/4: Set to Yes if you want to use / show the period’s strength bar. Show legend: Set to Yes if you want to show the “Strong / Weak” legend text. Show flags: Set to Yes if you want to show the country flag graphics. 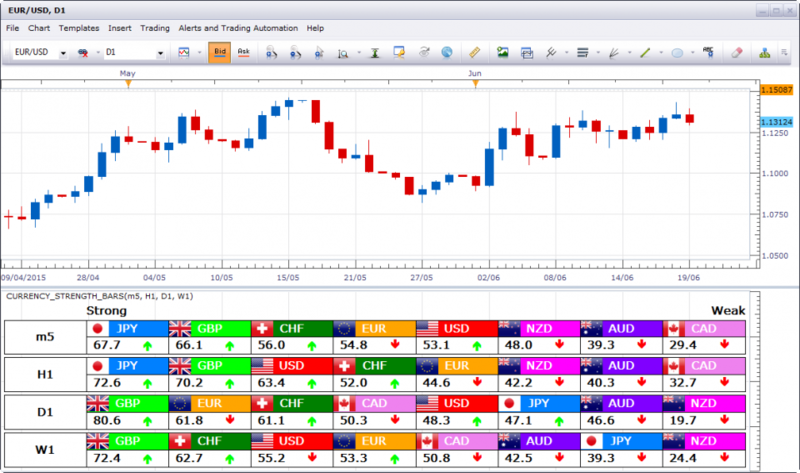 USD/EUR/GBP/JPY/AUD/CHF/CAD/NZD: Specify the colours for the USD, EUR, GBP, JPY, AUD, CHF, CAD and NZD. Background colour: This is the background colour. Line / text colour: This is the colour used for the lines and text. Currency text colour: This is the colour used for the currency text. Font: This is the font name. Font size: This is the font size. This indicator is only compatible with FXCM’s Trading Station Desktop. Additionally, an FXCM account is required (including free FXCM demo accounts). Note, when using a demo account, the “Lite” or “Lite+” modes of the indicator might be required, due to the limit on the number of currency pairs which can be subscribed.